Not all natural topsoil is equal. Some areas in Berks County have good topsoil, some do not. Topsoil can be unbalanced in pH, low in nutrients and organic matter. 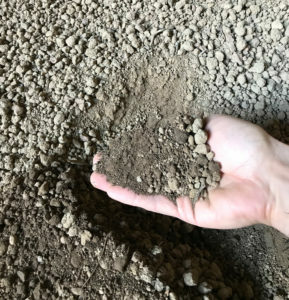 These can be corrected by first taking soil samples and submitting them to Penn State Agricultural Analytical Services Laboratory to find out what needs to be added to balance the soil for your application. This is the reason why we blend our top dressing to control organic content, pH and nutrient levels for consistency. It is typical and necessary for all topsoil to have stone in it. Without stone the soil will compact too much and prohibit permeability of water and air to the root system. We screen our soil to ½ of an inch, approximately the size of your index finger nail. To screen more stone out by making the screen size smaller hurts the growing process more than it helps. If topsoil is not mulched with straw the tendency is for the soil to be washed off of all the stone when it rains. The stone will be perched on top of the soil, making it appear to have too much stone. Do not remove the stone. Let the grass seed do its job and grow. The perched stone will work its way back into the soil where it belongs and help keep the soil working properly. SCREENED TOPSOIL is natural topsoil that is screened to remove rocks and debris. The vast majority of topsoil in Berks County naturally has very high clay content. The organic matter is typically 2% to 4% which is half the amount in our TOP DRESSING. High clay content is good for moisture retention, however root system aeration is not optimized. Short term grass seed germination is slightly easier due to moisture retention. Long term the soil has a tendency to harden thereby increasing difficulty for plug (mechanical) aeration and natural aeration. For more information on the differences and applications between TOP DRESSING and SCREENED TOPSOIL see our FAQ page.